These units can be mated to the 300 and 600 range of cleartides reactors... Running after a Sand Reactor or Nitrate Reactor to Re-Oxygenation unit... Before the water flow enters the aquarium or sump... Or run the tower independently to remove ammonia and nitrite from your system. When using inline with the reactors no additional pump will be required... The pump supplying the reactor will also supply the trickle tower. Flow rates: 500lph - 2000lph. With the addition air pump running within the tower, can increase beneficial bacteria growth by 3 times. Comes Complete With Media, Spray bar and fittings to suit application. Please state on ordering size of Inlet and Outlet Required. 12, 20, 25, 32, 40mm. When running inline the inlet will be the diameter of the reactor piping.. Ie 300 20mm and the 600 25mm. Base footprint: 165 x 165. The item "Trickle Tower 600 (600l 1300l). 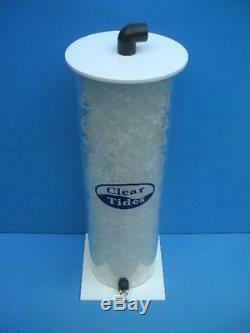 For use with Sand or Nitrate reactor" is in sale since Monday, October 27, 2008.